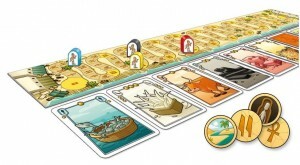 Sobek is a small 2-4 player, Egyptian-themed game where players take cards and lay down sets of 3 in order to score points over 3 rounds. During the rounds, 3 cards of the same type can be laid down as a set (wheat, cattle ivory, etc.) and you can increase a set already laid down by adding another set of 3 cards of the same type.